The mobile menu on the Twenty Seventeen theme should be sticky/fixed at the top while scrolling and when tapping on an item from the menu the menu should be closed automatically instead of tapping again on "Menu". @dEM0nsTAr thanks for your feedback and welcome to Trac. 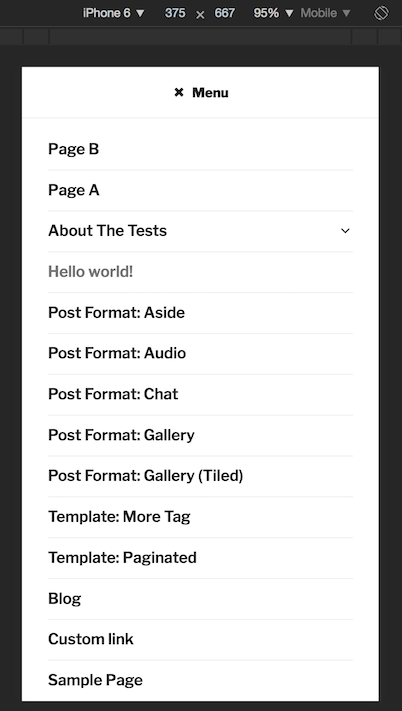 I'm not sure making the menu sticky on mobile would be ideal, since when the menu has a lot of items it would then be impossible to actually scroll it and see all the items (see screenshot below, with the suggested CSS applied). Not sure I fully understand the second issue, the themes team can answer far better than me I guess. I'm going to remove the accessibility focus since it seems to me this is not related to accessibility issues. Thanks for the hint with the scrolling @afercia ! Maybe there is a better solution to this but I still like the idea of a sticky/fixed navigation on top for a mobile device. Without "left: 0;" it even appears only in the top right corner. Hi @dEM0nsTAr. I think menu not being sticky on smaller screens is just a design decision. But you could certainly do that via child theme.